I found myself awake this past weekend at 7:50 a.m. Like, really? My alarm goes off every day for work at 5 a.m. and I dream about the weekend when I get to wake up naturally and sleep past nine. Of course, once I wake up and realize I have lots of errands to run, lessons to write, and cookies to bake, the guilt kicks in. That is how I end up baking pumpkin snickerdoodles in the kitchen at 8 a.m. on a Sunday morning. Last year I made these gems, which at the time became one of my favorite pumpkin recipes. While pumpkin chocolate chip cookies are still up there, pumpkin snickerdoodles are my new favorite. These cookies scream fall, and fill your house with the best scent EVER. Line baking sheets with parchment paper. In a small bowl, mix together the sugar and spices for the sugar coating. Scoop dough (approximately 2 1/2 tablespoons) and roll into a ball. Roll the dough ball in the sugar mixture, and place on the lined baking sheet, leaving about 2 inches between each cookie. Take a drinking glass with a flat bottom and moisten with water. Dip the glass in the sugar mixture, and use it to flatten the dough balls. Re-sugar the glass as needed. So, what you're saying is: cats like pumpkin snickerdoodles? Right? These sound awesome, and I just happen to have a) leftover pumpkin puree, and b) three cats that just might like snickerdoodles. wow yum! i just posted a snickerdoodle recipe. love the blog, iw ill have to subscribe! I love your pics...these cookies are amazing. 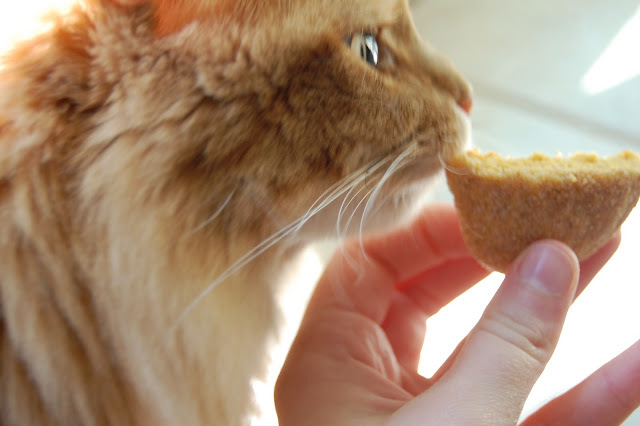 Love the cat and the cookie. Hi. These sound so great. Can't wait to try them out. Question...can I make the dough one night and refrigerate over night to bake the cookies the 2nd day? Thanks! Lisa, I don't see why it would be a problem- I would just let the dough sit out for a bit if it seems too firm. Hope that helps! let me know how they turn out if you do wait overnight! Omg these sound amazing!!! I love pumpkin anything and I can't wait to try these! 3 3/4 cups of flour? Is that correct? Not that I doubt you or anything, it just sounds like a lot of flour! I made these today and they were also extremely floury! I think they would be amazing with a little less flour. Hi there - sorry for the delayed reply! Just use 1 cup of pumpkin. I'm sure you could get that and some to spare from the standard 15 ounce can of pumpkin! Hi Anonymous - sorry you guys did not enjoy them. This is a recipe that my co-blogger posted (who has since departed the blog) so I'll have to have her weigh in on the pumpkin flavor the next time we chat. I've heard from a few people who have made these and been very happy with them, so hopefully you guys were just an anomaly! Hey Anonymous - sorry to hear you weren't a fan. If you click over to the original source, you can see that the other ladies who made this recipe used the same amount of flour. I wouldn't suggest trying less, since the cookies would most likely fall apart. Hope you can find something else on here that you prefer! I came back to refer to your recipe again after making them last week. They were absolutely delicious! However, I realized and accidental recipe change I had made. Instead of using one cup of pumpkin, I used a whole can haha...But they were very moist and pumpkin-y! Hey Jennifer - what do you mean by "missing" specifically? Like they didn't have enough spices maybe? If that's the case, I'd try adding some additional spices next time! Hope that helps! However, I probably wouldn't do the applesauce sub in cookies...I think that trick works better with cakes and breads! Glad you liked them otherwise! Hmm...by chance did you try and soften the butter in the microwave instead of allowing it to come to room temp on the counter? That could possibly be the cause. I'd just try sticking the bowl in the fridge for 30 minutes or so next time. Glad you enjoyed them otherwise! My daughter just made these and they were to die for! Loved them and could eat way too many of them. My first batch just came out of the oven and I have to say that these cookies are delicious! Definitely a new fall favorite. The flavors are perfect! Thank you for such a great recipe! I just made these for a bake sale at work and they were a HIT!!! They sold out first and EVERYBODY loved them!!! I live in CO and did cut the baking powder in half because of our altitude and they turned out perfectly fluffy and moist! Thank you so much for a wonderful recipe! I wish I had read some of these reviews before making these. I agree with another post, all I taste is flour. At least my kids seems to like them. Made these yesterday and I LOVE them! I love that they are not over-powered with sweetness. They are a very mellow pumpkin snickerdoodle. I'm impressed : ) I try to make something every week from Pinterest (this is what I picked for this week) and blog about it. I'll be posting about these cookies soon! Check it out, if you'd like! I'm a new blogger and can really use the input on those Pinterest Posts. Just baked a bunch to send to Afghanistan heroes....rethinking sending them. Look great, but a bit bland. Agree with others...possibly too much flour. These sound great, looking forward to trying them! But a snickerdoodle isn't a snickerdoodle to me without some cream of tarter... Any thoughts about what that might do to the taste? I have some leftover pumpkin from making pumpkin zucchini bread, so I'll give it a try in the next few days and let you know how they turn out! I probably wouldn't add cream of tartar to these just for the taste, since they contain baking powder. Cream of tartar is typically used in recipes calling for baking soda, since baking soda needs an acid (like cream of tartar) to activate it. Baking powder already contains an acidic component, so simply adding cream of tartar to this recipe might throw all of the chemical reactions off. If you wanted to use cream of tartar in this recipe, I would suggest switching to baking soda instead of baking powder. I want to stress that I have NO idea if this will work, or even what proportions to attempt it in. I think with a little googling you might be able to find out a proportion that could work. If you decide to experiment, make sure to come back and let us know how things work out! I made these last night and will definitely be making them again. They were so soft and delicious! Hurray! Glad to hear that you enjoyed them Calie! I'll make these up a cookie balls, then freeze. When ready to bake I'll thaw them on a parchment lined baking sheet, then press with a sugared glass. how many cookies to these make? i can't wait to try them! they look so good! WELL. I was talking on the phone when I put these together and I used a CAN of pumpkin. . .So, I had to double the recipe. I didn't realize it but the second addition? Forgot the second two sticks of butter. They came out wonderful without the additional butter. .My husband loves them. What size of a can do you use for the pumpkin puree?? You just need 1 cup of pumpkin, not an entire can. I wish I had read the reviews before I made these. They aren't bad but they are VERY mild in flavor. Would I make them again? No, sorry. So sad,I really need to get some nutmeg! I just made these as well and, while I agree that they are nothing like snickerdoodles, they are moist and delicious. For those who say they have no pumpkin flavor, the pumpkin is used to add moisture, not necessarily flavor. You'd have to add a WHOLE lot more pumpkin to get the pumpkin flavor. I have made these twice now and they were fabulous! Perfect with a cup of tea. My dad and boyfriend devoured the first batch in a couple days and immediately asked when I would be making more! For those who think there's too much flour, be sure you're not packing the flour into the cup. Do not scoop the flour out of the bag with the measuring cup. Sprinkle it into the cup or sift it in or you will have to much flour! I'm going to be making these for a school function. After reading the reviews, I'm going tweak it by adding more sugar & spices & the whole can of pumpkin. I will comment again to let you know how they turn out. I added more pumpkin today and I think they are baking very well. Pretty "moist". Hoping it all comes together okay. I used the whole 16oz can. I just thought you'd like to know that this recipe won me points on the first day of my job a month ago, and now I'm taking it on an overnight trip with my coworkers...by demand! Based on the reviews I doubled the spices in the cookies. They tasted liked they were missing something to me so I added cinnamon cream cheese frosting and that solved it for me! Great basic cookie, but I agree more spice is needed...maybe add pumpkin pie spice and/or allspice to the dough. Initial bite is great but after taste leaves you wanting a little more. Not a bad recipe and certainly worth tweaking. Just made these last night! I added some pumpkin pie spice because I really like a spicy cookie, and added some nutmeg to the sugar/spice coating. They're really good - cakey and soft and pumpkiny. I took the recipe and really tweaked it by adding double the pumpkin and probably double the spices. I used powdered sugar instead of regular sugar. Instead of trying to make them into cookies, I spread the batter into a greased 9x13 casserole dish and an 8x8 dish and baked until the centers were done. I spread cream cheese cinnamon frosting over the top and had some YUMMY cookie bars! That solved the flavor problem I saw a lot of you were having (not enough pumpkin and spices)and the dough problem (too sticky). With the frosting, it was perfect when added to the not-too-sweet dough. Made them as the recipe suggested, with absolutely no changes. They were fantastic. Delivered them to some other teachers at my school - all rave reviews and recipe requests. To each his own, I guess! I have a Snickerdoodles recipe I really like, but I want to add Pumpkin. Do you think I could just add it? Or do i need to adjust ingredients? Hi Brooke! Errr...or Chloe? Confused about the two different names but almost identical comments. If you try it, please come back and let everyone know how things worked out! THANK YOU for this recipe! I think like every southern woman (well, maybe any woman who LOVES to bake), I experience a great sense of pride when I make something for my boyfriend that he just can't get enough of! I made these two days before Halloween, keep in mind the recipe yields about 3 dozen cookies, and they are already gone! He has already requested more! If I could just have his metabolism for ONE day! For those of you who say that they are quite flavorless, I would suggest eliminating the ginger and all spice that goes in the sugar mixture and adding pumpkin pie spice instead! I also took some of the sugar mixture and sprinkled it on the cookies before baking! THANK YOU AGAIN! I baked these cookies on Tuesday night for a Halloween party my work was having the next day. I was so excited to make them. I might have added a tad bit more pumpkin to the batter, but not too much. Once I put the dough in the fridge for an hour, I decided to look at the comments about the recipe. I started to get a little worried on how the cookies would come out when I saw some of the comments. But, I decided to keep an open mind. Once the hour was finished, I made the sugar coating. I didn't have any ground ginger, but instead I opted with just sugar, cinnamon, dash of all spice, and a dash (or two) of pumpkin pie spice. Once I baked them and took them out of the oven, I waited the 5 minutes and tried one. Omg, they were so GOOD! I thought they were just absolutely heavenly. When I brought these to the party, I had a lot of people enjoy them. There were even a few who wanted the recipe! I definitely will be making these again! So glad I found this recipe, it's so unique too! I love Pumpkin. I love Snickerdoodles. I love Pumpkin Snickerdoodles. This is basically the perfect cookie. I made it a few weeks ago and they were a rave! Now, I'm getting requests for them again. Thanks! After reading all the comments I doubled the amount of pumpkin for more flavor. The dough was really sticky, but other than making a mess this didn't really affect the baking of the cookies. They are amazing!!! So, so good. They definitely are not the gooey, chewy type, much more cake-like so don't be surprised by that. Would definitely recommend, delicious!!! After reading all the comments, I double the amount of pumpkin for more flavor. The dough was really sticky, but other than being a bit messy this didn't affect the overall baking of the cookies. They are amazing!! So, so good! They are definitely not the gooey, chewy type, much more cake-like so don't be surprised by that. I would definitely recommend these, they are delicious! I made it just like directed, then tried the dough but there wasn't a lot of flavor just like the reviews had said. So I tweaked it a little bit :) I added 1/3 cup more pumpkin, doubled the cinnamon and added a tablespoon of pumpkin pie spice, added 2 Tb of molasses, and 1/4 cup more white sugar. It was delicious after that! I didn't even think about making these...not even for a split second. I saw the recipe...scanned the ingredients to make sure I had everything and started the dough. I had really hoped these were what I imagined when I saw the picture on pinterest. I followed some suggestions above and still ended up with cookies I wouldn't share with others :( too cakey and not at all pumpkiny. I guess I'll continue to keep looking for the perfect recipe. Hi Melissa, they are actually supposed to be cakey! Pumpkin contains a lot of moisture which contributes to a cakey quality in baked goods. I'm not sure what alterations you made, but perhaps give the original recipe a try on your quest to find the perfect version! A lot of people who didn't make changes have really enjoyed these. If you're looking for more of a traditional snickerdoodle that's chewy, refer to the complete recipe index on here, as I have a great one. Thanks for stopping by from Pinterest! Just made these and they are great. Gotta pay attention to the temperature of the butter at the start, then make sure you really do refrigerate the dough before rolling them into balls. Very mild flavor, reminds me of European pastries that are not saturated with sugar and spices. Thanks for the recipe! Thank you for the inspiration! Looking forward to making these and welcoming fall back into my oppressively hot southern kitchen! What is the measurement for 2 sticks of butter ??? 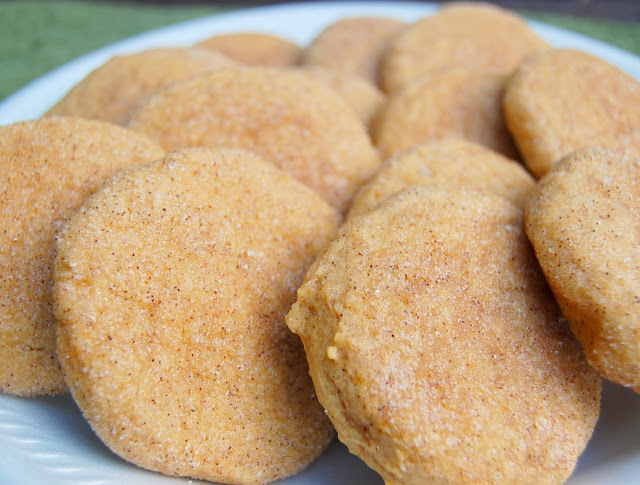 I have a very similar recipe on my web site they are called frosted pumpkin snickerdoodles. I adapted the recipe myself from a favorite snickerdoodle recipe I used often. I entered it in a local baking contest and came in second..yippee Wishing you much success with your blog. I just made these, and they turned out great. 2.5 Tablespoons makes a large 3-4" cookie (I got 30 cookies)they also took about 13-15 min to bake. You could make smaller balls, and get probably twice the yeild. Keep an eye on the cook time) It would be the perfect size for kids or afternoon teas. The flavor was good, but given some of the comments, I doubled the cinnamon. If I can't find pumpkin puree can I take canned pumpkin a puree it? I'm definitely going to have to try these this fall - they look super yummy! I followed the recipe, but subbed pumpkin pie spice as the only alteration and I agree--they are pretty bland and flavorless. I am not a snickerdoodle girl, but had planned on sharing these at a monthly work meeting...and probably won't because they are not that great. Mostly a floury, light orange cookie. It needs a lot more spice (and I upped the amount of pumpkin pie spice) and some more sugar--these were like a very bland scone sadly. Sorry to hear that these didn't work out for you! darn, these sounded so good for the fall, I wish I would have read the review's before I just made a double batch for our church coffee hour. this is a very tough, cakey, not great flavor little cookie. I thought for sure with all this butter it would be a tender, yummy cookie, I bake alot of cookies and this one is just not good, too much flour. next time I will read the reviews. Well, as much as I wanted to like these cookies, I have to say that they are more like tea cakes. If they had been named "pumpkin tea cakes" I would not have expected a cookie taste. They are,however, perfect for afternoon tea. Look forward to exploring your other recipes. I am baking these for Thanksgiving. For those of you who think they're "missing something" chances are, it's Cream of Tartar. I haven't made these yet, but really it's not a snickerdoodle without cream tartar And 2 tsp ought to do it, it's probably wise to replace the baking powder with Baking Soda as well. For those of you food nerds who know that Baking soda + Cream of Tartar = (more or less) baking Powder. yes, yes it does. But Cream of Tartar is what imparts that wonderfully unique tang of a classic snickerdoodle. I'm excited to try these. My dough is in the fridge now. I added pumpkin pie spice instead of nutmeg to my dough be I didn't have it. I'll let you know how it goes and I'm also going to add some to the sugar mixture before baking. We'll see! Thanks for the great recipe! they sounded good, but they are way too flour-y. I asked my mother once I had discovered it and she said that is way too much flour no matter the cup of pumpkin you may be compensating for in the mix. Didn't use the rest of the batter, started from scratch. Jus' Sayin. these were AMAZING!!! LOVED them, and i was scared b/c of the comments, but that just made me even more pleasantly surprised. a favorite from now on!! I made these last week as my new Christmas cookie to add to my mix. They're delicious, like little pieces of cake. I made my cookies smaller (about 1&1/2" ball) and got over 6 dozen. The only change I made was adding Pumpkin Pie spice to the sugar mix for rolling, instead of 5 spice. They're a hit and I'll add them to my annual cookie list. Delicious!!!!!!!!!!! Thank you!